StopIGM.org is reporting LIVE from Palais Wilson in Geneva, expecting tough questions for NZ, and both New Zealand and South Africa to be reprimanded by 30 September. Dr Patrick Tuohy (Chief Adviser, Ministry of Health, Wellington, NZ): « [Undiscernible] Minister, and I believe this was your question. NZ is of course aware of that historically there had been cases of early gender assignment, as was the current medical approach some decades ago. New Zealand has a multidisciplinary network of surgeons and endocrinologists who discuss all cases in which there may be concerns about a child’s gender, in accordance with international best practice the default practice is non operative support that [undiscernible] network of endocrinologists and surgeons are confident that no medical practitioners in NZ are working in isolation. After the Session: I spoke briefly to Dr Patrick Tuohy, making sure he got a copy of our thematic NGO report (which he said he had studied in advance), though it was somewhat of a challenge getting a word or two in inbetween. Dr Tuohy’s standpoint was that there wasn’t sufficient proof of IGM practices still taking place, as “hypospadias repair” from his point of view wouldn’t count, and the sources given for NZ children operated on in Australia (from 2013 and 2009) were too old to contradict his claim that surgery had stopped (latest in 2006). 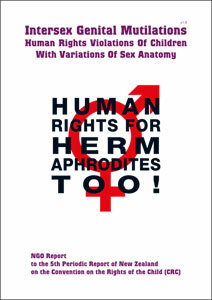 He further argued he had studied the framework of harmful practices and found that it was not applicable to IGM practices anyway, as from his viewpoint intersex surgeries wouldn’t fit the definitions stipulated therein (apparently despite stating he had studied our NGO report he was unaware that over the last 2 years, CRC has so far found IGM practices to constitute a harmful practice 6 times). 12:22h: CRC Chair just announced that follow-up questions and answers might also extend to the NZ OPAC session this afternoon. 13:01h: The Session and the live stream are on! Dr Patrick Tuohy (Chief Adviser, Ministry of Health, Wellington, NZ): « In respect to intersex. There was a question with three parts. The first was, do we have a legally binding system to prevent genital normalization on children? The answer is that we do not currently have a legislative framework for this, and there is no plans in place for that at the present time. However, all New Zealand citicens are covered by health and disbility bill of rights, and all medical practitioners work under the authority of the Medical Council of New Zealand. 18:00h: Session closed, to be resumed tomorrow.